The Flatbush Boys took to the road Monday night, and followed flight plans that though different in nature, netted victories for both fall season Varsity clubs. Close to home, the Varsity Boys Basketball team took their game to Hudde Junior High School’s gym where they showcased their talents against the host team from Yeshiva Derech Ha Torah. From the start, it was clear that the Falcon team that came to play was one well-oiled machine that was clicking on all cylinders. With the trademark pressure defense on display from the opening tip, Derech Ha Torah was just not equipped to deal with everything the Boys from Flatbush had in the arsenal. Taking additional advantage of the team’s strength in the depth of its bench, the Falcon’s showed why they are a collection of nearly interchangeable parts. Making their first and second starts of the season respectively, Joey Dweck and Buddy Setton helped set a torrid scoring pace, feeding Point Guard Joey Dayon early and often on his way to 18 first-half points (he would finish with a team-high 21 points). And, with Michael Haddad coming off the bench for the first time this season, it was like hitting the turbo boost button, moving the team into another gear that Derech Ha Torah just couldn’t keep pace with. At intermission, Flatbush enjoyed a comfortable 40-14 lead. In the second half, the Falcons brought more of the same, and it just did not matter who was on the floor in Flatbush maroon. Behind the leadership of Bobby Soffer, the Falcons nearly doubled their first-half total, finishing with 78 points on the night, with every player seeing significant minutes and all but one team member putting points on the board. This was a very nice tune-up in advance of the big showdown in Brooklyn Tuesday night when the Falcons take on the North Shore Stars in a big divisional match-up. Two bridges and a river away in Paramus, NJ, the Varsity Falcon Hockey team was busy putting on a show of its own. The Falcons took on the Cougars of Frisch, a top-ranked Western Division team that would present a stiff challenge for the experienced Falcon squad. For the second game in a row, the Falcons found themselves trailing, when poor face-off execution led to an early Frisch goal. But from that point on, the defense shut the door and the offense went to work. The second period was key for the Falcons, as they rode the power and style of the first line to 3 goals with Sam Laniado, Morris Bijou and Moe Maleh each finding the back of the net – Bijou scoring on a breakaway after a great team defensive effort created the turnover and Maleh going 5-hole to net what would ultimately be the game-winner. In another stellar performance, Sam Laniado tallied a goal, an assist and a penalty (two, actually) - a Yeshiva League version of a "Gordie Howe Hat-Trick" (generally a goal, an assist and a fight in the same game) – now that’s old time hockey! 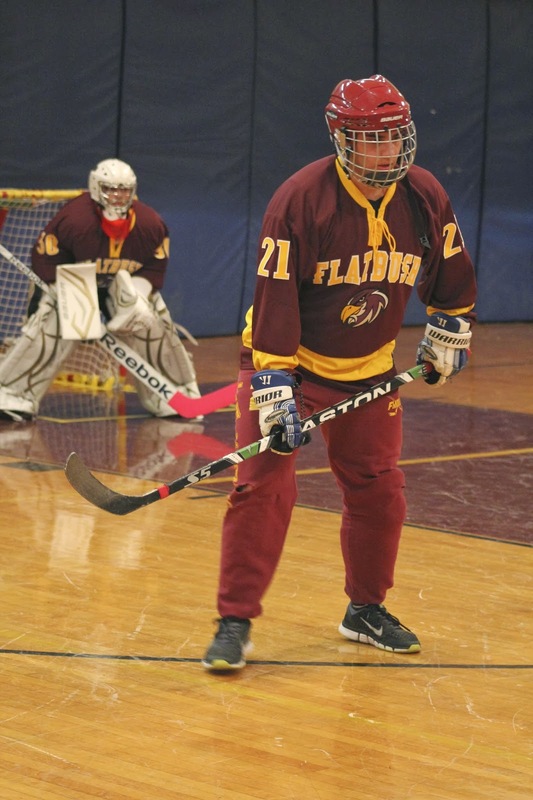 But the story of the game was the goal tending of Senior net-minder Stephen Esses. In what could be termed a career breakout game, Esses was outstanding, turning away shot after shot to preserve the victory. Many of Esses’s stops on the night were highlight-film quality (send a memo to ESPN to send a film crew next time out!) Esses was on his feet and moving, giving him the ability to get across to stonewall the cougars time and again. After Frisch cut the lead to 3-2 after a controversial goal allowed by the officials late in the third period, Flatbush buckled down and killed off the remaining four and one-half minutes. The shutdown defense was sparked by Sol Sasson and Moe Maleh, both making one fine defensive play after another to seal the big win. The Girls Basketball team dropped both ends of a double header on the road at Ramaz. In a rematch of last season’s league championship game and with two of the team’s starters still sidelined and out of action, the Falcons made a much better showing this time around, losing by 22 points (the Rams won the championship game by 30 last winter). The Varsity was paced by Merle Cohen’s 15 points from her center position on the court. The JV team dropped a 9-point decision 38-29. Esther Harary led all JV Falcon scorers with 10 points; Sarah Horowitz added 8 in the losing effort.